The Four Kannon Temples of Owari . When the famed Buddhist monk, and compulsive wood-carver, Enku , took up residence at the Arako Kannon temple (Kannonji, in today’s Nakagawa Ward) in 1676, this venerable temple was already over 900 years old, having been established in the early Heian period of the 8th century. Housing one of the region’s most important Kannon (Goddess of Mercy) statues, Arako Kannon has retained its pre-eminence in the district to the present day. Of additional interest is the fact that of the various structures on-site when Enku arrived, one is still in existence. The two-tiered Tahoto (treasure) Pagoda had already been standing for 140 years in 1676, and it is still there in 2008 – a Muromachi Period building designated as a national cultural asset, and by far the city’s oldest structure. Records indicate that, in 1536, the pagoda was rebuilt by local carpenters, partially from materials from an earlier structure on the same site. Despite the periodic fires which have devastated most temples at one time or another during their histories – as recently as 1994 the main temple building of Kannonji was destroyed by fire – the Tahoto Pagoda has so far remained safe from this scourge for 472 years! During his residence in the temple, Enku completed around one thousand wooden figures, ranging in size from a few centimeters to the huge 3 meter figures which act as temple guardians, situated in the temple’s main gate. 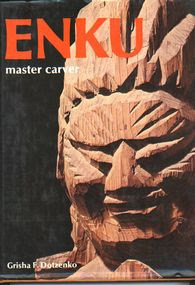 Most of these figures, however, were lost to history from the time immediately after Enku’s departure. Amazingly, it was 300 years before they were found – nestling in carefully-packed boxes, covered in dust, located in a recess within the Tahoto Pagoda. In 1972, Arako Kannon’s then chief priest opened these ancient boxes and made the discovery. 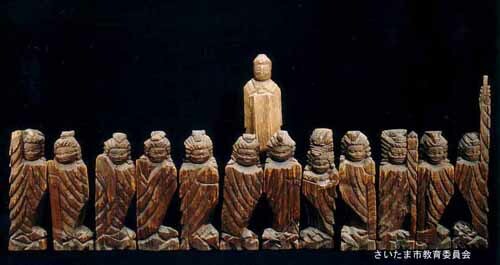 A museum was set up within the temple precincts soon after, containing 1,255 wooden figures. It is worth a visit, as is the oldest building in Nagoya nearby. 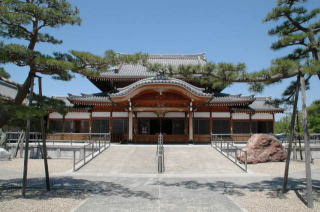 Arako Kannon is one of the four major Kannon temples in the Owari region. This is a temple of the Tendai sect of Buddhism named Kannonji. It is famous for about 1200 Buddhist statues made by Enku in the site. It was established in 729 and repaired in 1576 by the lord of Kaga, Maeda Toshiie. Its tahoto pagoda was repaired in 1536. The pagoda is the oldest wooden building in Nagoya and is registered as a cultural asset of national importance. It was established by a monk, Taichou-Taishi. in 729. The main temple had destroyed by a fire many times and rebuilt again of each time. The latest fire broke out in 1994 and rebuilt 1997. But the two story pagoda called Tahouto has been kept since the last construction in 1536. This is the oldest wooden structure in Nagoya City. In Arako Kannon, they have approximately 1240 images of Budda carved by Enkuu (1632-1696). We can view them in the afternoon of the 2nd Saturday every month. 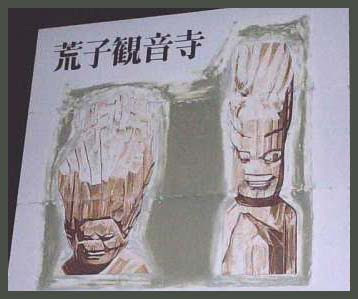 Enkuu is a very famous monk who traveled to many places in Japan, from Hokkaido to Shikoku and Kyushu, and carved so many images of Buddha so called Enku-butsu. He was close to the 10th monk of Arako-Kannon, Ensei. Maybe, that is why he left such a large number of the images of Buddha there.